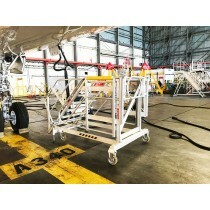 Yes, we supply height access solutions for this aircraft. Enquire now or submit your specifications here. Any Airplane. Anywhere. All Safe. The aviation industry is reliant on professional and efficient ground maintenance to keep fleets flying. Any drop in safety standards not only means a risk to the aircraft in the sky, but also a risk to personnel on the ground. Having a tight maintenance schedule to accommodate commercial air travel is no excuse for cutting corners around the hangar. Every single flight and aircraft needs to be treated the same, with strict adherence to air safety regulations. However on the ground is also critical, as stringent workplace regulations apply, particularly when working at height. Whether you are in charge of a commercial, civil or defense aviation facility, safety is paramount for achieving efficiency. 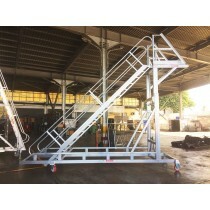 Do not risk personal safety and clamber freely at height over wings and fuselages, see custom aircraft maintenance platforms from SafeSmart Aviation, the global leaders in height access on the ramp. From anywhere in the world, contact SafeSmart Aviation today. 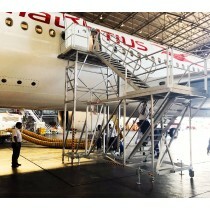 Safesmart Aviation helps our AMEs to work faster, amazing result. In civil, defense or any other subsector that relies on well-maintained aircraft to operate, a well-equipped workshop is critical for productivity, accuracy and safety. SafeSmart Aviation Director Jeff Wearmouth discusses our capabilities for fixed wing aircraft, and some past projects that have helped MROs achieve optimum results, thanks to an improvement in height access safety. 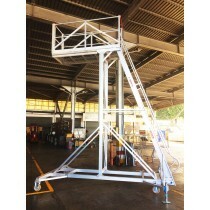 SafeSmart Aviation has a deep understanding of the civil aviation industry, and the regulations that apply to ground support equipment all around the world. From the UK’s HSE to the US’s OSHA and beyond, all of SafeSmart Aviation’s aircraft maintenance platforms are designed and built to comply. We have a finger on the pulse in anticipation of new models of aircraft from all major manufacturers, so we can build and develop maintenance access solutions that suit the aircraft exactly before an airline acquires them. Our process is to conduct onsite measuring and design, however we are also able to work with the aircraft manufacturer’s drawings and specifications that will inform our designs before the aircraft rolls off the production line. All fixed-wing aircraft manufactured for civil use are accommodated for in our current designs. 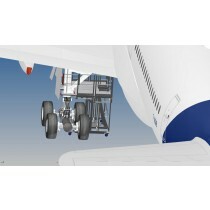 See our aircraft selector to see if your needs are catered for. If what you are after isn’t in the list, we can custom build anything to get your ground crew as close to the working area as possible, without the platform touching sensitive parts of the aircraft – an essential trait that makes sure that no ‘minor’ depression in the skin creates major damage at speed in the sky. For any defense force, maintenance is crucial to a fleet that is required to be ready to stand and deliver. 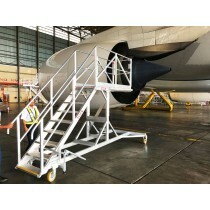 Of course, back at base, ground maintenance safety regulations can be adhered to in a static hangar or ramp. But in combat zones or temporary airfields, upholding these standards can be a challenge. 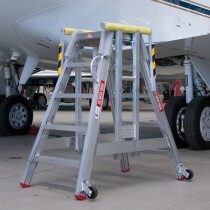 With SafeSmart Aviation’s products, lightweight yet robust aluminum designs that can be quickly dismantled or folded means that safety for engineers, mechanics and technicians can be maintained while working at height anywhere in the world. And again, SafeSmart Aviation’s knowledge of military fixed-wing aircraft is second to none. See our aircraft selector, or contact a representative from anywhere in the world to help bring safety and efficiency to the maintenance workspace. Whether you’re in procurement for civil, commercial or defense aviation, contact us for consultations and custom solutions for your workshop. SafeSmart Aviation’s products comply with all applicable safety regulations in each country or region they are supplied to. There are representatives available for advice and consulting right around the world, who carry out free site safety audits and provide custom-designed solutions that fit the need perfectly. Occupational Safety and Health Administration – OSHA, USA. the Health and Safety Executive – HSE, UK. Civil Aviation Safety Authority – CASA, Australia.